We’d love your help. 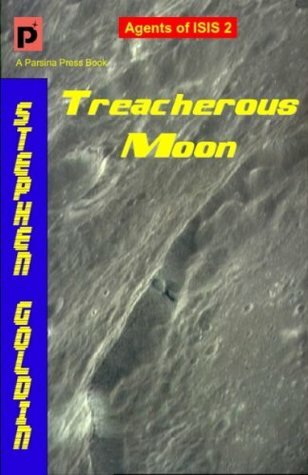 Let us know what’s wrong with this preview of Treacherous Moon by Stephen Goldin. To find out, the Imperial Special Investigation Service dispatches its two best agents to look into the matter--and the shocking truth they reveal leads to a chain of discoveries that eventually threatens the stability of hu Hundreds of thousands of people have visited the pleasure moon Vesa and simply vanished without a trace. Is this part of some vast galactic conspiracy? To ask other readers questions about Treacherous Moon, please sign up. Born in Philadelphia in 1947, Stephen Goldin has lived in California since 1960. He received a Bachelor’s degree in Astronomy from UCLA and worked as a civilian space scientist for the U.S. Navy for a few years after leaving college, but has made his living as a writer/editor most of his life. His first wife was fellow author Kathleen Sky, with whom he co-wrote the first edition of the highly accla Born in Philadelphia in 1947, Stephen Goldin has lived in California since 1960. He received a Bachelor’s degree in Astronomy from UCLA and worked as a civilian space scientist for the U.S. Navy for a few years after leaving college, but has made his living as a writer/editor most of his life. His first wife was fellow author Kathleen Sky, with whom he co-wrote the first edition of the highly acclaimed nonfiction book The Business of Being a Writer . His current wife is fellow author Mary Mason. So far they have co-authored two books in the Rehumanization of Jade Darcy series. He served the Science Fiction and Fantasy Writers of America as editor of the SFWA Bulletin and as the organization’s Western Regional Director. He has lived with cats all his adult life. Artistically, he enjoys Broadway musicals and surrealist art. Philosophically, he is an atheist.